Just to erase any confusion, we’ll explain this as simply as we can. Beer goggles make OTHER people more attractive to YOU. Beer socks make YOU more attractive to OTHERS. We understand if you confuse the two, it’s ok, it happens to the best of us. Beer goggles are bad, unless you like hitting on people who make trolls look like swimsuit models and Chippendale dancers. 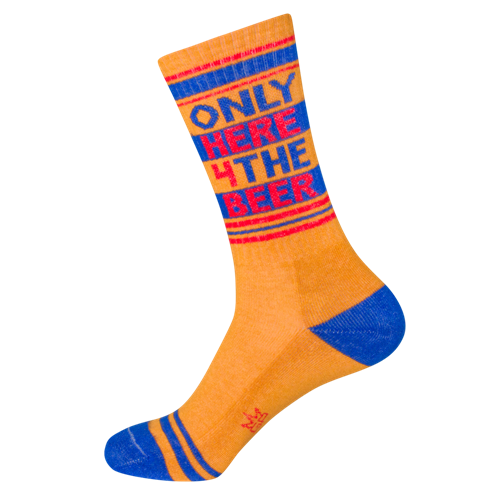 Beer socks on the other hand, are great. They make YOU look attractive to ACTUAL swimsuit models and Chippendale dancers. Yes, we do speak from experience. One Size Fits Most. 75% Cotton, 17% Polyester, 5% Spandex, 3% Rubber. Made in USA. These wide ribbed socks reach to mid-calf on most folks and fit a women’s size 6 US to men’s size 15. As a thicker weave, these socks are optimally worn with sneakers and other roomy shoe styles. Machine wash cold, line dry.